For most of this year, GA and business aviation has been fighting to defend the incorrect perception that people flying on board private aircraft are overpaid, filthy rich, greedy CEO types. If you listen too long to the cable news channels or anyone in an Anchor's chair, you might come away with the notion that private aviators have a blatant disregard for the environment, our economy or Average Joe and Jane standing at the corner of "Walk" and "Don't Walk" in Mainstreet, USA. I've been secretly carrying on an informal survey, asking random people I meet this question: "If you had Bill Gate's money, would you still fly coach or even first class via the scheduled commercial airlines, or would you fly in your own private business jet?" I did not plan how I was to conduct this survey, and just carried it around in my head for the last few weeks. I tried not to hint that I was a pilot, but about 60 percent of the people who answered already knew this, which may or may not have tainted their answers. There was the working stiff/blue collar guy working at the gas station in Syracuse, NY that simply said "hell yes" when asked if he would choose the bizjet. At a wedding I attended recently, three other people - all upward professionals from Detroit or the NYC area - all told me that without question they would dump the airlines in favor of private air transportation if they had unlimited cash. Back home in environmentally-sensitive Eugene, I expected a different result, but did not get it. 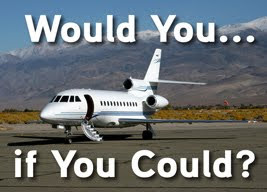 I polled four people at one of my weekly meetings or via email, and all would have chosen the bizjet, however one did say she'd buy carbon offsets with her pile of unlimited dough. [Of note is the fact that she could not with any degree of certainty tell me how much bizjets pollute, or if they were more or less fuel efficient than an airliner full of Grandmas.] And to close out this 10-person informal survey, I found two others here in Eugene, one who called travel by bizjets "extravagant" but added she'd relent and fly her jet if she had the choice. The last person I asked here initially said no, he would fly commercial to save fuel. But when asked if he would choose the Friendly Skies if his bizjet was powered by veggie fuel ginned from sorghum or algae, he instantly changed his tune and said he would happily choose the biofuel business jet. There it is, 10 out of 10. I sure hope the traditional media types who keep floundering around with their "Automakers flew to WDC in their private jets to beg for a bailout" stories see this post and second-guess their decision to try and gain traction with such lame arguments. Uh. Huh. Like I really have that much sway. Because [caution - cliché alert] at the end of the day, when given the chance, I believe the majority of Americans would choose private air travel if money was not an issue. But it is - more so than ever these days - so Mom and Pop will still have to gamble on the the hub-and-spoke system and hope they get where they wanted to go. For the rest of us who have acquired a pilot's license and bought our own flying machines, we get to occasionally do it ourselves, beating the airlines at their own game. Not on all flights, and not in all weather, but on short hops in anything but the most severe convective wx, GA is the answer.